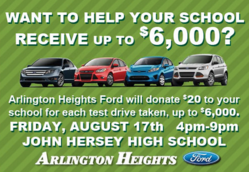 Area residents can help raise up to $6,000 for John Hersey High School by taking a test drive on August 17 from 4 – 9 p.m. at Arlington Heights Ford. Arlington Heights Ford has long been one of Chicagoland’s premier auto dealerships, not only because of their excellent inventory and affordable prices, but also because of their involvement with the community. It’s with this in mind that they’re pleased to announce the upcoming Drive One for Your School test-drive event to benefit John Hersey High School. The Drive One for Your School event will take place at Arlington Heights Ford on Friday, August 17 from 4 p.m. to 9 p.m. During these hours, the dealership will donate $20 per test drive taken to John Hersey High School, up to a maximum of $6,000. This is a simple way for area residents to contribute to a good cause in their community. The fundraising event is part of Ford’s nationwide promotion to raise money for local schools through test drives. In past years, the program has proven to be a remarkable success, raising in excess of $10 million for U.S. schools over the course of 3,000 events. Money raised has been used for a variety of purposes, ranging from funding additional educational programs to helping mitigate the cost of damages to school facilities due to natural disasters. The money from the event on August 17 will go to projects chosen by John Hersey High School. This is Ford’s way of helping communities around the country, and Arlington Heights Ford is proud to be taking part in the initiative. Arlington Heights Ford has a legacy of helping local communities, exemplified by $10,000 in past donations to Wheeling High School, $6,000 to Buffalo Grove High School, and contributions to Palatine High School. All of this together shows the value their dealership places in local schools. They are proud to help the community in any way possible, and proud to represent the Ford brand. They’ve got all the latest Ford cars, trucks, and SUVs available, in addition to a variety of pre-owned models. Their knowledgeable sales associates can provide drivers with all the information they need to choose the new car that's right for their needs. Car buyers can visit their dealership on Friday, August 17 to see everything that they have to offer, and to take a test drive to benefit John Hersey High School.